1、what is the East Mould? 2、What about the size scope of moulds you can make? Moulds reach to length 4 meters, width 2.8 meters, and 40 tons in weight. 3、Do you ever make injection mould and blow mould? Yes. 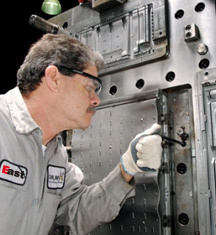 East Mould have provided such kind of service to some of our customers and gain more experience in this field. 4、Do you build hot runner moulds? Yes, we build hot runner moulds and are familiar with different systems such as DME, Yudo.The manifold used for your tool is selected to satisfy your demand. 5、What type of files can you accept? East Mould can accept different types of files such as IGES, DXF, DWG, STP, PRT, X_T, PDF. 6、What type of steel do you use when you work? Buderus 1.2738(Germany), DAIDO NAK80 and NAK55(Japan), IMPAX 718H(Sweden), LKM 738H(Dongguan), LKM2344(Dongguan), P20HH(USA), P20LQ(USA), LKM 2311(Dongguan), LKM 2312(Dongguan), etc. 7、what kind of material do you use ? ABS, PP, PC, PE,HDPE,POM, PA6, PA66, PA6+GF, PS, PMMA, TPU, TPE, PVC, etc.We have rich experience for molding product with these materials and know how to adjust Parameter to get the perfect product. The quotation we offer to you including the cost of sample delivery. We send sample by DHL, UPS,EMS or TNT. 9、How to pack and ship mould? When the mould have been completed, we will paint grease on the surface, pack the mould with plastic pellicle, and put it into a disinfected wooden box. Attached Accessories: 1.Mould drawing in A1 paper size; 2. Related electrode; 3.Ring bolts, 4. material certification, 5.Mould locking sets and other necessary accessories. 10、Do you sign non-disclose agreement? Yes. We understand the sensitive nature of your design. It is our policy to comply with requests for non-disclosure agreements. If we don't get your kindly approval, we would not disclose any information regarding your product or you company to the third party and any copy would be prohibited.